The Electric Information Age Book explores the nine-year window of mass-market publishing in the sixties and seventies when formerly backstage players-designers, graphic artists, editors-stepped into the spotlight to produce a series of exceptional books. Aimed squarely at the young media-savvy consumers of the “Electronic Information Age,” these small, inexpensive paperbacks aimed to bring the ideas of contemporary thinkers like Marshall McLuhan, R. Buckminster Fuller, Herman Kahn, and Carl Sagan to the masses. Graphic designers such as Quentin Fiore (The Medium Is the Massage, 1967) employed a variety of radical techniques-verbal visual collages and other typographic pyrotechnics-that were as important to the content as the text. 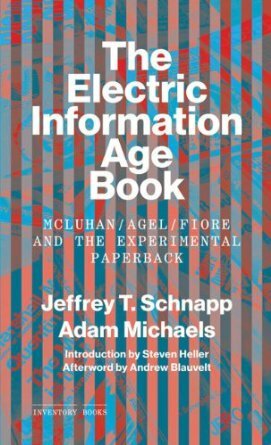 The Electric Information Age Book is the first book-length history of this brief yet highly influential publishing phenomenon. Text: Schnapp Jeffrey T., Michaels Adam. pp. 240; 150 BW ills. ; paperback. Publisher: Princeton Architectural Press, New York, 2012. Michaels Adam, Schnapp Jeffrey T.